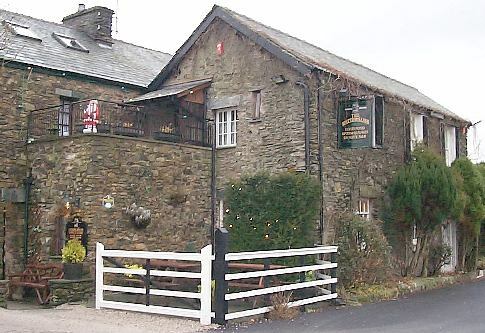 A family-run pub that can get very popular with drinkers and walkers in the summer. 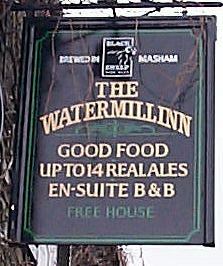 The pub is an old watermill and you can still hear the sound of the stream from bedrooms 1 and 2 at night. Constructed of local stone it is set just off the A591 20 yards down a lane near the petrol station. Partly obscured by trees and foliage it has a relaxing air about it. When you see a lot of cars you know you've arrived. Inside there are two bars. In the right one you can sample the real wood burning stove and the main eating area. 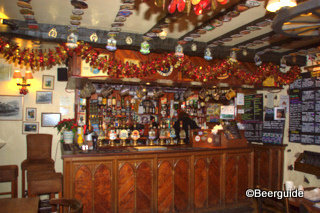 In here are dark wooden tables and chairs (some rocking) on a dark carpet, the bar is on the left covered in pump clips. There are also storytelling nights in here from a professional storyteller on the first Tuesday of every month. It can get busy then, but get here early and enjoy the friendly atmosphere. 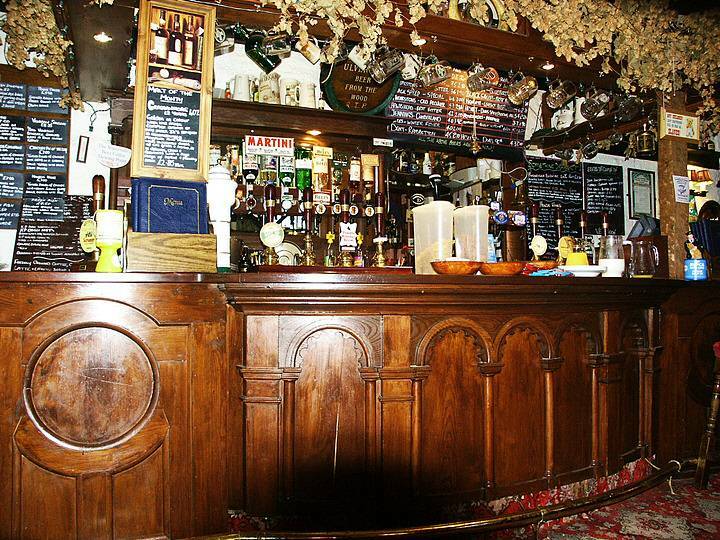 The other bar has a low beamed ceiling and wood panelled bar (created out of church pews) with real fire. Tables and chairs (some benches) are again dark wood on a carpeted floor except for an area around the bar. There are plenty of hand pumps here too. A separate room moves off from the left hand side of the room, it snakes round past the cellar which you can look into through a wagon wheel style window. 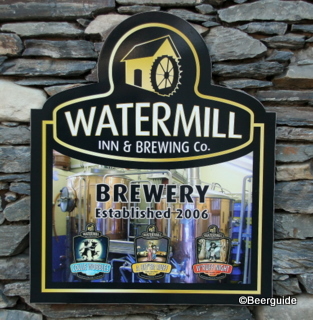 An excellent beer choice of up to 16 different ales at once. 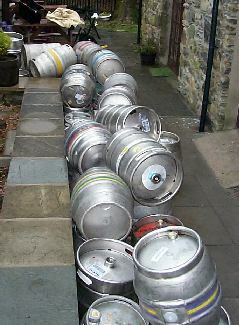 Permanent beers come from the pubs own brewery, plus Coniston Bluebird and Old Perculier. They usually have six or so of their own beers on at any one time plus guests. They also serves continental beers on draught and in bottles. Hoegarden wheat beer on tap. Food (served all day) is traditional including a huge Cumberland sausage meal, soup, fish and steak (a couple of vegetarian choices are available from the chef). There is no music, pool tables or fruit machines only the sound of talking. Out front is the beer garden where you can enjoy the sun and the view. Children and dogs welcome. Surrounded by pleasant walks and beautiful countryside. Windermere is only a mile or two away. Very comfortable accommodation is available from �72 prpn. Wheelchair access is good to both bars, though a little difficult to toilets. 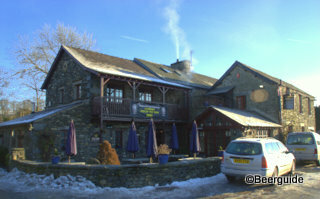 South Lakes pub of the year 91/93/94/95/96/97/98/99/01/02, Pub of Cumbria 2002, Westmorland Regional winner 1997, 2009 and CAMRA pub of the year 2009. Now with a CAMRA star in its Good Pub Food Guide.